“Love knows not what time is” -UnknownBeing a full time student and working a part time job takes up a lot of time during the week. Adding in the essentials of eating and sleeping and other bare necessities, like time to de-stress and spend with friends and a boyfriend, eats up any time left behind. To compensate for the hectic schedule, I’ve become a master of multitasking, and even with that, I tend to sacrifice sleep to have time for everything else—after all, you can always make up sleep during a holiday! However, having such a tight schedule leaves little time for romance, and having a boyfriend whose schedule is just as busy as mine makes it near impossible. On an average day, I have classes and work from 9:00 am until 7:00 pm. My boyfriend works seven days a week as a personal coach and often works from 6:00 am until 9:00 pm with sporadic breaks in between. Also, both of us have tight budgets which makes doing some things out of our price range. However, in spite of our messy schedules, we manage to see each other often. The key to our success is—ironically—not planning. We both have schedules that are never fixed, and trying to plan around times that are subject to change at any moment makes planning a futile and usually disappointing effort. We don’t set up strict times when we should meet and instead look for any moment we both happen to be free and take advantage of it. This usually results in short meeting at cafes, running into each other to quickly say hello, and often meeting up late at night for a quick dinner before we both head home to pass out. While we see each other regularly, our time together is all too brief and we have fallen into a rut of doing the same things which tends to dampen any surprise and romance in the relationship. At first, never planning times to meet up did help somewhat since it prevented our relationship from becoming another obligation to add to our seemingly never-ending list of things to be done. But it didn’t help break us out of our “greet-and-eat” rut which we eventually stumbled into. We tried just varying where we went to eat to add a new flair to our old system, but it quickly became just as routine to wander looking for a new place as it was to eat at a place we had been to before. It seemed like the rut would be impossible to escape unless both of us deliberately took off work, and even then it would be a temporary fix to a continuing problem. A new solution revealed itself in the form of a friend’s own relationship problems. The two of us were were talking over coffee, and she began telling me how she felt her boyfriend wasn’t willing to contribute as much to the relationship as she was. She told me how she often went out of her way to do things with him that he liked though he often didn’t return the favor unless it was something he also enjoyed doing. At first the situation seemed nothing like the issues my boyfriend and I were having: both of us were willing to do things the other enjoys—we just didn’t have time. I suggested that she try making him do little things that he might not enjoy and work her way up to bigger things so that he might find some enjoyment in it by the end. I suggested looking at the Campus Clipper to find coupons for things she might like to do on her college budget, and, while discussing this option, I noticed a coupon for I coffee shop I hadn’t been to. After I went home, I realized that I had found a solution to my own relationship problems. The next time I met with my boyfriend, I suggested we pick a book we would both like to read and meet up to talk about it at the new coffee shop since we both enjoyed reading. From there, we tried cooking dinner together rather than going out to eat like we usually did, and then we began including other little things along the way to vary up our usual schedules, realizing that little changes made a big difference. Not only have these little suggestions that we started coming up with made our time together more exciting, it has introduced a little more passion since both of us are always thinking of small romantic things to mix in. 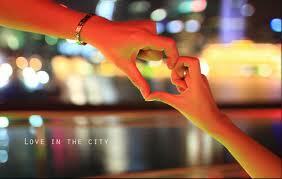 It has given a breath of fresh air to our relationship, and found us the time for romance despite our busy lives. If you run into a rut with your own relationships, try changing up the things you do and be sure to look at the Campus Clipper for ideas and deals! One of my favorite things about the holidays is visiting friends from my hometown and hearing what they have been working on for the past year since I last saw them. Inevitably, the small talk about little things, the new job, the minor promotion, and the fabulous apartment always arrives at the big kahuna of girl talk: our relationships. All of my friends from Milwaukee are in serious and very happy relationships. Each time my girlfriends and I arrive at this topic, the group turns to me and says, “So, Betsy, are there any guys in your life right now?” to which I always respond, “I’m not seeing anyone special.” My friends, being the sweethearts that they are, say, “Oh, well—you’ll find a great guy eventually,” with that ever-present edge of pity in their voices. The topic officially shifts from my paid acting gig to how I can use college discounts to get a two for one deal on Ben and Jerry’s ice cream. While this statement is very true, it makes self-love feel like a key point en route to a desired destination when in reality, loving yourself is the destination. Be careful of turning self-love into yet another step in finding a partner; I find that this can lead to missing out on an extremely valuable chance to get to know yourself. A healthy relationship grows from mutual respect and the desire to grow and learn with another person. You end up cheating yourself when you settle for something that is not right for you just because you want a partner. Relationships should be optional detours on the road to self-love, not rest areas to cry at because you can’t properly experience the view. Get back in the car. Keep driving. There will be other opportunities. I have noticed that a few of my single peers have a fear of being alone forever. I recently went out on a first date with a man who, within the first fifteen minutes, asked me why I was still single, when I was thinking about getting married and how many children I thought I wanted. He then proceeded to talk about how he wanted children and was looking for a permanent partner. My friends in relationships talk about how many children they think they want and stress over when their boyfriends will propose. My single friends troll OkCupid and plan their fantasy weddings on Pinterest. This is not how to gain self-love. You will drive yourself crazy trying so hard to get something you do not have. Be happy about what you have now. And calm down—you have time. I love my single life. I have all the time in the world to pursue my interests such as my yoga teacher certification, writing my full-length play, auditioning, doing community service and playing Nintendo Wii like a boss. Self-love is all about accepting exactly where you are in the moment and embracing and celebrating it. I am still single because I want to be. I’m only twenty-four and marriage is not a concept even remotely close to my mind. And, if maternal instinct kicks in, I will happily buy a puppy. Vive la single life! 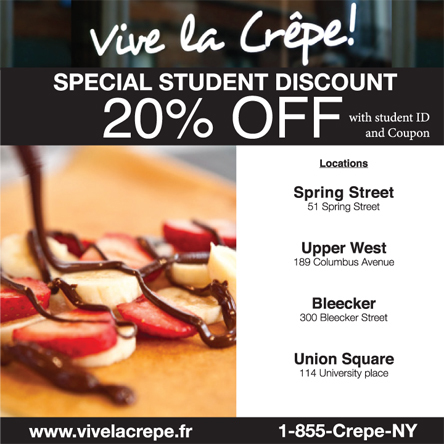 Treat yourself to a delicious, discounted crêpe at Vive la Crêpe! Betsy K. NYU. Like me on Facebook! Follow me on Twitter! Also follow Campus Clipper on Twitter and Like us on Facebook ! College is a great time to reshape yourself and discover who you’ll grow to become as a person. We gain so much during these years— friendships, independence, knowledge . . . two or three inches around the waist . . . If you see yourself “reshaping” in a way that you didn’t exactly plan, you may have already met the “freshman fifteen.” A scary thought for many. Never fear, however, for this fate is preventable, and indeed reversible. You just need to recognize the pitfalls of campus health and learn to avoid them. If you’re living at school, and especially here in NYC, there are dozens of ways to avoid weight gain and even become fitter than you started out. In fact, this is the perfect time to experiment with different health-care techniques and establish a good tone for your new life as a young adult. Ready for some tips? Make good choices in the dining hall!! This one seems obvious, but it’s by far the biggest reason first-year students tend to put on weight. Your dining hall (if it’s anything like mine) is well-stocked with greasy goodies, fried and battered, full of salt and sugar. You will find these foods everywhere. Of course this is where your meals are coming from, and you probably paid good money for your meal plan, so don’t let it go to waste. But it’s not mom’s cooking. Take this into account when you pick meals; you’re in charge of your own nutrition now, and the school’s not going to force broccoli onto your dinner plate. It’s up to you to choose the salmon over the pizza and the peas over the French fries. There’s a salad bar— use it. Go for something green over something beige, and take it easy at the ice cream station. Basically, use common sense here! We all know by now what a healthy diet looks like. I’m not saying that you should never indulge; just don’t underestimate the effect that it will have on your health if you’re eating nothing but junk food. Campus Clipper Deal- Save at Metro Drugs! Make the most of your school’s gym. You’ll wish you still had it when you graduate and have to pay for your gym membership. Try to make it there even a couple times a week and you’ll feel yourself getting stronger. Regular exercise will give you more energy. Try bringing a buddy along. A friend ca n help to motivate you as well as make your workout a little more fun. Take advantage of your school’s gym equipment— a little goes a long way here! Campus Clipper Deal- Latin Dance lessons at Piel Canela! So go ahead and reshape your life. You don’t have to let your freshman fifteen semester become a pattern for your next four years! So I just finished up my last fall semester as an undergrad. It’s really shocking how quickly college has flown. Everyone told me that would happen; guess I never believed them. I’ve been through seven finals weeks now, only one more to go. You’d think I’d be a pro by now, right? Nope, this December was an agonizing test of my sanity— a grueling and unforgiving string of all-nighters fueled by caffeine and slowly-dwindling willpower. Sleep for ten hours every single night. Read all the books I’ve always meant to read— become an expert on the classics and a well-versed authority of the NY Times best-seller list. Get up at 8am everyday and do a three mile run “wake-up” run to replace this new dependence on stale, over-sweetened coffee. In my visions of a post-finals life, I am well-rounded and happy, without stress. I like to believe that, left to my own devices, free of classes and deadlines, I’d be exactly the person I wanted to be (as if the only thing stopping me from reading War and Peace were my grammar final). These are not fantasies, but actual expectations— goals. I really don’t want to say that these thing could never happen, because that leaves me very little to hope for. I mean, they very well could happen if I gave it some effort. 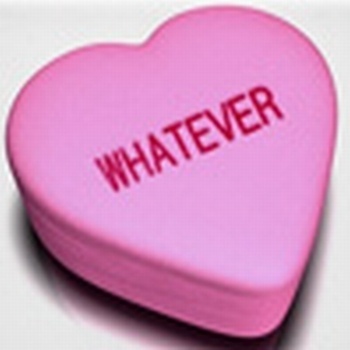 All I’m saying is that it just so happens that it hasn’t worked out the way I planned so far… ever. Once I take that last exam or hand in that final term paper, my mentality switches immediately to that of a brain-dead monkey. Sure, I’ve done some reading. But it’s so hard for poor Shakespeare to compete with Minecraft. And have I caught up on the sleep that only weeks ago I’d been craving for? Only if you count daylight hours. I’m just as zombie-like during the day as I was during finals, which is pretty disgraceful when I think about it. I think this is it: I need to binge on something. At school it’s work. Big chunks of unsurmountable work that I barely survive, mentally or physically. At home, it’s hours upon hours of internet vomit— anything to stimulate my brain momentarily, or to occupy my time which has apparently become worthless, suddenly. I’m still tired. I’m still unhealthy. So nothing’s changed. Unlimited Yoga– $50 for One Month!